Discussion in 'Flashcart Help' started by senter, Jan 22, 2018.
i am new of this world, so i am here to ask for help. My cousin gave me an old Nintendo DSi XL v. 1.4.4E, and i want to buy an R4 to play all my old games. Can someon tell me which R4 i have to buy for this console? Prefereably the R4i Gold, but then again since NDS/DSi been left for years by now. Just get whatever flash cartridge you can find on the market/shop which supports DSi v.1.45E or v.1.45U. Ask the seller to preinstall the kernel for you (you'd need to provide him/her an SD Micro or buy 1 from them so they can install it for you there) to make it easier on you. Then you'd want to add latest TTMENU/YSMENU third party kernel/firmware to your SD Micro (you can find it in the Firmware Section of this Forum) to make it support all NDS/DSi game rom. Relying on just the cart's original kernel/firmware will not let you play more than half of the NDS/DSi game collection. So, even if i have the 1.4.4E fw, i have to buy a cartridge for 1.45E? Can you give me a reliable site where to buy an R4? I live in Italy for the moment, and I can not find Italian resellers. Sorry, I can't recommend any online flash cartridge seller site. You'll have to research through Google for a reliable one. Make sure to cross-check with the flash cartridge's official website to see if it's still hosting the kernel/firmware to install to the SD Micro. Many flash cartridge site been inactive or closed. Can you give me an indication on the price? How much should it cost more or less? Probably +/-USD20 just for the flash cart (excluding shipment++). I found this flash cart in my house! Is it ok for my DSi XL? Have i to download the fw?? 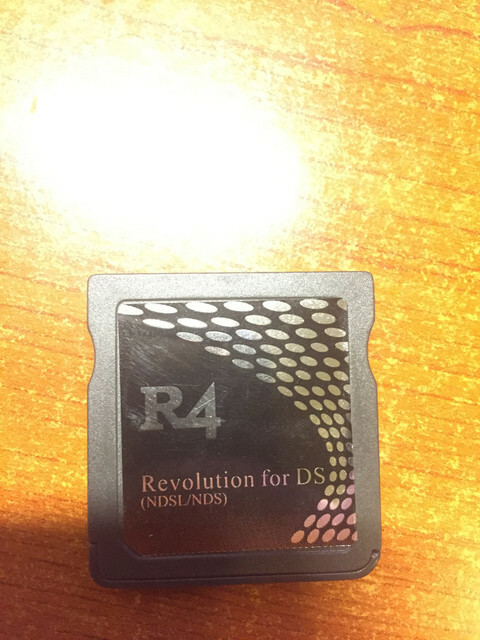 That's the Original R4 Revolution for DS that can only use 1GB and 2GB SD Micro (non-SDHC). Only works on NDS Fhat (first gen NDS) and NDSL (second gen NDS). That's the Original R4 Revolution for DS that can only use 1GB and 2GB SD Micro (non-SDHC). Only works on NDS Fhat (first gen NDS) and NDSL.